President Trump displays his presidential memorandum reinstating nuclear sanctions on Iran at the White House on Tuesday. "We will be instituting the highest level of economic sanction," the president said Tuesday. "Any nation that helps Iran in its quest for nuclear weapons could also be strongly sanctioned by the United States." Five other nations — the United Kingdom, France, Germany, Russia and China — have indicated they plan to remain in the deal. Iran has said it is studying whether it can still reap enough economic benefits to remain in compliance. 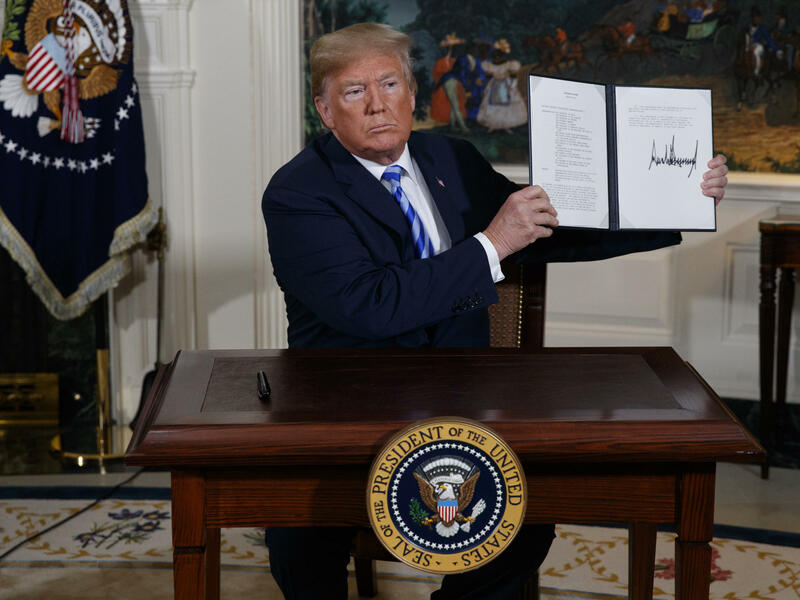 The reluctance of other nations to abandon the pact, under which Iran will limit its nuclear activities for a decade or more and agree to permanent inspections, opens a significant gap between the U.S. and its most vital European allies. One question after Trump's announcement was how far the U.S. will go in pressuring the allies to follow the president's policies. Peek, the deputy assistant secretary of state for Near Eastern affairs, offered the administration's clearest answer yet: "We're certainly going to be pushing and asking and cajoling them to disinvest, absolutely," he said on NPR's Morning Edition. To pressure allies, the U.S. intends to apply "secondary sanctions" on non-American firms that do business with Iran. "The way they are employed best," Peek said, "is through a constant iterative process where we engage those countries, we prod them in certain ways, cajole them in others, and gradually we reduce the amount of investment going into Iran." But, he noted, "The purpose is to prevent Iran from conducting all kinds of malign activities, not to sanction our partners." Richard Nephew, who helped design Iran sanctions while serving in the State Department under President Barack Obama, told Morning Edition on Wednesday that it will be difficult to persuade Europeans to change course. "I just was in Europe last week," he said, and "the government officials that I met with were pretty clear that even if they as individual governments would support such an effort, the entirety of the EU, which of course has to come together ... to vote in favor of such sanctions, is opposed." It would also be difficult, he said, to persuade the 28 nations making up the European Union to reject a nuclear agreement that took years to achieve.